We need you and your friends and neighbors to comment this weekend! 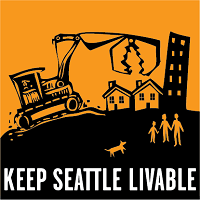 The Draft Environmental Impact Statement (DEIS) evaluates the Mandatory Housing Affordability (MHA) program impacts on Urban Villages, and in multi-family and commercial areas throughout Seattle. Residents from many neighborhoods have reviewed and analyzed the DEIS. The results are available in the Comments folder and the Analysis folder. Please view the comment and analysis documents, find the issues important to you, and email your comments to the City at MHA.EIS@seattle.gov or by using the online form. Submitting many brief comments is probably preferable to sending one long email. The more people who submit comments, the more seriously the City has to address the comments! “The DEIS is not sufficient to represent all Urban Villages and the City overall. Each Urban Village is unique, with different housing types, cultural traditions, businesses, resources, and growth needs. This DEIS fails to recognize and examine these differences. Each Urban Village and Surrounding Area needs to be analyzed separately, thoroughly and accurately via their own individual EIS. The City’s DEIS documents may be viewed or downloaded from the City’s MHA Environmental Impact Statement website, or from copies in the EIS folder on the Wallingford Community Council (WCC) website. These are large documents! The main document is 50 MB, and the appendices are 95 MB. This entry was posted in Calls to Action, Land Use, Parking, Quality of Life, Schools, Shorelines, Transfer Station, Transportation, WallHALA on August 4, 2017 by Frank Fay.